I broke my ankle this past weekend playing touch football. Yes, you read that right. TOUCH. Football. (also, complete fracture of the fibula!) I’ve always been a bit of a walking time bomb, but this is special, even for me. The silver lining to being injured and having to ice and elevate my injured limb all day long? Reading time opened up on my calendar like magic. 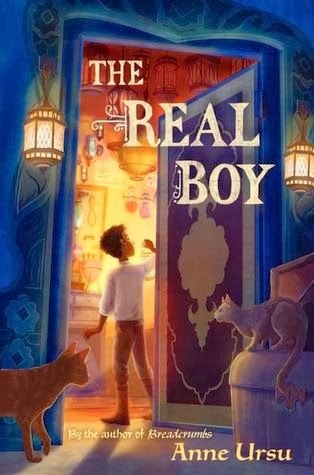 And since it was (over)due at the library, I picked up Anne Ursu's The Real Boy first. It turned out to be a charming fable about magic, choices and human character. Oscar is the hand of the last magician in the world. A hand in Barrow terms is the person who does the menial tasks that an apprentice can’t be bothered to complete. And Oscar is content with his place and his fate – he’s an orphan, after all, and feels most comfortable working with plants and talking to the cats that live in the cellar of Master Caleb’s shop. He’s safe, useful, and can sneak away to read in the library in the middle of the night. However, events conspire to thrust Oscar out into the world outside of his cellar, and he must deal with customers, with a strange sickness that affects only children, and with the most surprising thing of all – a friend. In doing so, Oscar will learn about the magic and history of his land, and what his future holds. Oscar lives in a very limited world - mostly in the cellar of a shop. When he's not in the cellar, he sometimes ventures to the forest to gather plants, and rarely out into the marketplace. The narrative was pretty clear in suggesting that Oscar had agoraphobic or OCD tendencies, or possibly that he registered somewhere on the Asperger's spectrum. What did that mean for Oscar as a character? It meant that decoding gray areas and human interaction were hard for him. And since the reader experienced the story from his perspective, much of it was hazy, vague, or simply unexplained. This added atmosphere and sincerity to Oscar's story, but it did not forward the world-building - and that is a hard bargain to make in the world of fantasy fiction. Speaking of the world-building, what there was of it was well-done. When Ursu meandered out of fable-land and into reality, she described a world that was interesting and flawed, peopled with conflicted citizens and magic users. Ursu's plot played with a well-known fairy tale, but I was most intrigued by the details of the Wizard Trees, the plaguelands, Asteri (the city walled by magic), and the 'shining people' who resided in that city. In addition, the prose was quiet without being boring, and encompassed Oscar's narrow world and its truths while also describing the confusing complexity of humanity. And let's not forget Erin McGuire's illustrations! She made Oscar's experiences come to life. As I mentioned above, my chief reservation was related to the vague, slightly unfinished feel of the story. It had the distance of a parable or allegory, no matter how vivid Oscar and Callie's interactions and arguments were. I wondered at points if I was missing the grand metaphor. Was Asteri meant to symbolize religion? Capitalism? I worried that I didn't get it. Now I wonder if I was overthinking it all? Perhaps younger readers would understand and accept the small gaps I noticed. I couldn't, but The Real Boy was still a beautiful, albeit perplexing, read. Recommended for: fans of fairy tale retellings and fables, and those who like quiet fantasies that focus on character and a quest for truth. Sounds great but I'm sad to hear about your ankle. It totally sounds like something I would do. I hope you're better soon sugar. Oh it looked like it would be good story!